…it is bigger than what’s being formally reported. The U.S. Bureau of Economic Analysis released a report early this month estimating the size of the “digital economy.” According to this analysis, the digital economy accounted for 6.9 percent of GDP, or $1.35 trillion, in 2017. 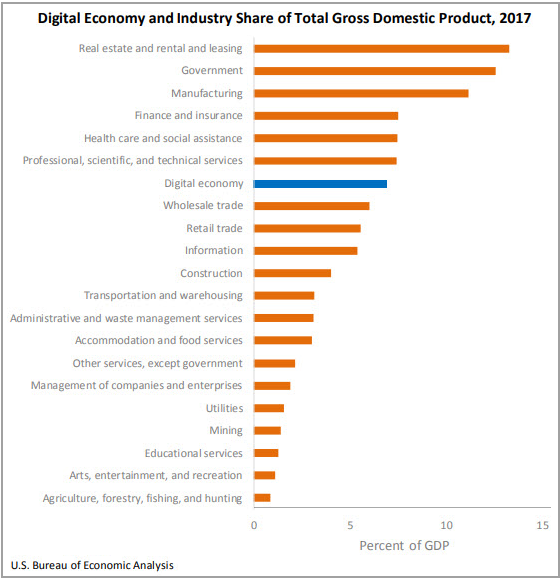 As noted in the following chart, the digital economy came in behind sectors like real estate and manufacturing, and ahead of wholesale, retail and construction. There are questions, however. Namely, how is “digital economy” defined, and how limited is its scope? After all, the digital economy today touches nearly every sector of the economy. So, as the BEA gets more precise in its measurement, we’re going to see that the digital economy accounts for an even larger percentage of GDP, economic growth and jobs – and that should surprise no one.